Moving to the cloud — it sounds easy in today’s environment with so many services available. But, the reality is that a high number of cloud transformations fail, wasting money and frustrating IT and business leaders. Commentators and analysts have put true success rates for big transformation projects at 30 percent or lower. Maybe expectations were too high, but, in many cases, essential steps were missing. IT teams started migrating applications and services without going through important preparatory stages. In some cases, the business didn’t have a cloud strategy or roadmap in place. Or, users weren’t prepared for the changes in working style that cloud provides. Cloud transformation isn’t on the same scale as digital transformation, but it can deliver essential benefits of agility and efficiency, as well as increasing opportunities for innovation. And, a successful cloud transformation can save time, money and effort. The big question is — where to start? For many businesses, the task is to make the transition from a legacy environment to a cloud-first position. But, it’s not just a single process of lift and shift. 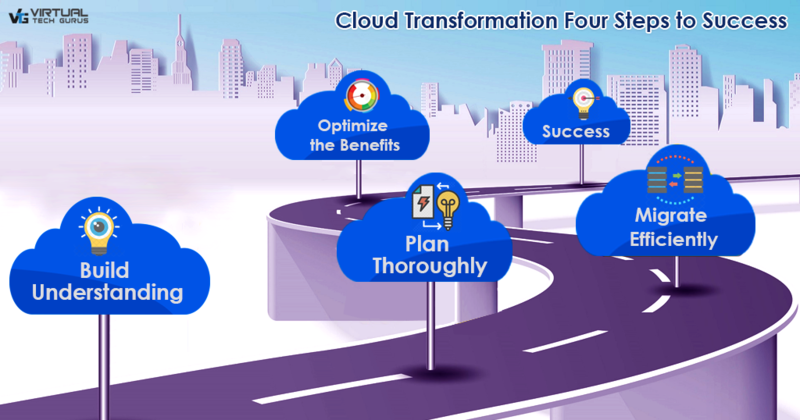 A four-step phased approach can help organizations move through different stages of ‘cloud maturity’ — understanding, planning, migration and optimization. The ‘understanding’ stage is for businesses that are considering cloud before taking the first steps. Here, it’s essential for IT and business to work together to identify needs and obtain executive-level support for cloud transformation. That may mean raising awareness of cloud and its potential benefits, as well as the implications for changing working practices. Workshops and case studies can help to build understanding of a cloud-first environment, while a pilot program can provide a live demonstration and build confidence among users and decision makers. The planning stage must ensure that all considerations and risks have been taken into account. The key decisions at this stage revolve around strategy, resources, budgets and operational plans. A clear strategy and transformation plan ensure that the project is focused on the right business, technical and operational objectives. Engaging with experienced consultants can help decision makers clarify objectives and establish priorities. Without adequate budgets and resources, a cloud transformation project is doomed to failure. However, for IT teams that don’t have cloud skills or lack time to focus on transformation, working with a cloud specialist can reduce the potential cost and resource requirements. The migration stage can be a complex, time-consuming process that involves discovery, assessment, data capture and reporting before workload migration begins. So, it’s important to have a plan that minimizes downtime and keeps costs and resource requirements at an efficient level. An alternative approach is to work with a cloud migration specialist that uses automation tools. VTG’s ZENfra, for example, can cut lead times by 30 to 40 percent and reduce costs by 25 percent compared to traditional in-house methods. Even when workloads have been successfully migrated to the cloud, the transformation process doesn’t stop. During the optimization stage, there are opportunities to maximize the benefits and the return on investment. An essential part of the process is to ensure adoption by training users and encouraging them to make full use of the cloud-based services. Business leaders can use the new capabilities to develop new working practices, increase collaboration or improve mobile and remote working. And, IT can focus on improving efficiency and optimizing costs, while spending more of their time to develop new services, rather than just managing legacy processes. If you would like to know more about our cloud transformation and migration services, please check out the articles and infographics on our website.